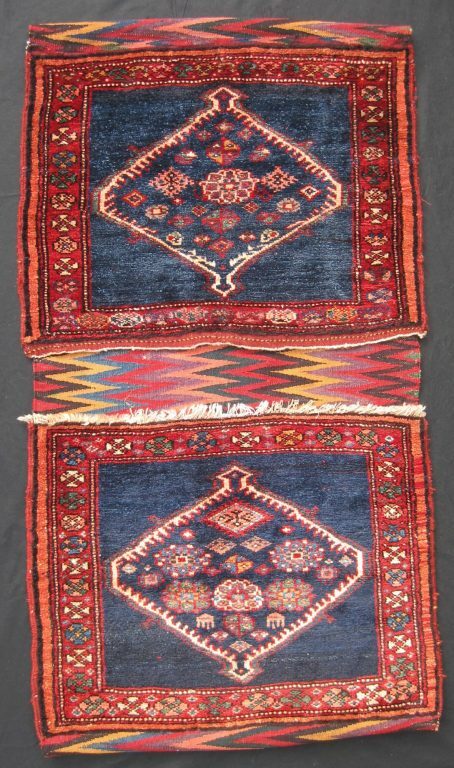 This large khorjin (double-sided bag) was made in the Bidjar region of the Kurdish part of Iran in the late 19th century. Bags of this size were used as saddle bags for the transport of loose items on the back of pack animals, which was particularly needed during the migration between summer and winter pastures. The wool pile of the bag faces is very deep and chunky. The design is a hexagonal medallion shaped more like a diamond which is serrated facing inwards and filled with floral and geometrical motifs and two talismanic patterns in the shape of combs (or amulets?) in the bottom half of the bag as shown in the image. The dark blue field is enclosed by a main border on a red ground decorated with a chain of floral and geometrical designs. The kilim on the back is also made of wool; it has a most dazzling design of zigzags in a wide range of powerful, naturally dyed colours, including purple. The khorjin is a very beautiful example of tribal weaving and is in perfect condition.